I have been working hard on my next book, “Home For the Heart.” It takes place in 1900. The main character is nineteen-year-old, Liz Gilbertson. 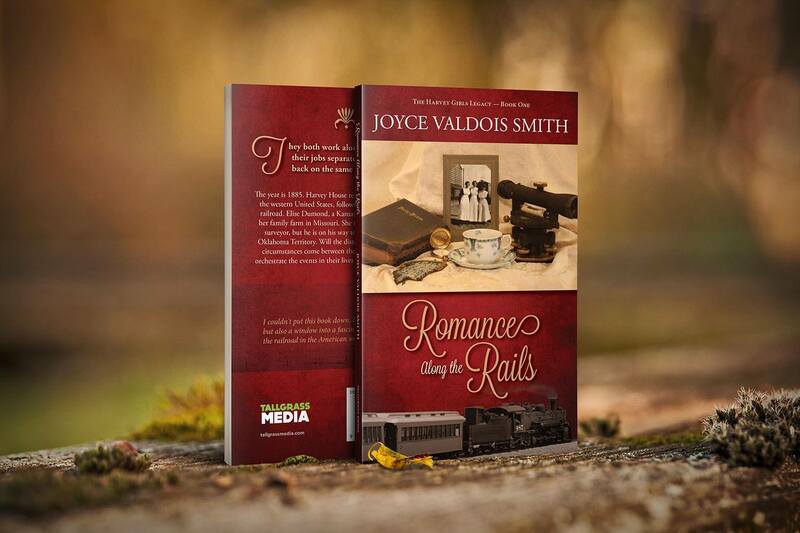 If you have read my first book “Romance Along the Rails”, you will recognize Liz as four-year-old, Elizabeth Tilman. Elizabeth was orphaned when her parents were killed in a carriage accident. She now lives with Daniel and Elise Gilbertson, her uncle and aunt who have taken her to be their daughter along with their own children, Adam, Julien, and Rachel. Elise loves her adopted family yearns to learn about her birth father’s family. She has also recently been jilted by her fiance. Michael Brannon arrives from Boston, to work as Daniel’s accountant at the AT&SF Offices in Topeka. He is attracted to Liz, but she’s not ready for a new relationship. Liz is restless and decides to become a Harvey Girl to refocus and redefine her future. Harvey Girls worked along the railroad. Fred Harvey opened the first Harvey House in Topeka, KS in 1876. For the first few years, men worked for him as waiters. The Harvey Girls joined Fred Harvey’s empire along the Santa Fe in 1883. The first waitresses were hired in Raton, New Mexico, when Harvey fired all of his waiters because of poor service. 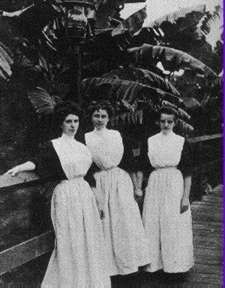 Fred Harvey decided to hire young women to work as waitresses. These waitresses were the first respectable women many of the cowboys had ever seen, aside from their wives or mothers. 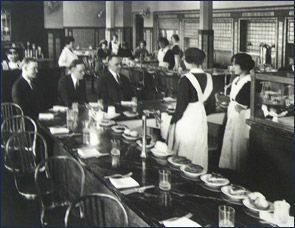 Harvey’s new waitresses were so popular in the community and among railroad passengers and employees that he decided to replace all the waitresses on the line. Harvey advertised in midwestern and eastern newspapers and women’s magazines for “young women 18 to 30 years of age, of good character, attractive and intelligent,” to go west to work. Skeptics said the kind of women Harvey wanted would not work for him, but they did. The women who answered his ads did so for many and varied reasons–economic considerations were the most prevalent, but adventure, a change of scene, and life in a new territory were also factors in young women’s decisions to join Harvey in the West. With the regimentation of an army boot camp, Harvey initiated the Harvey Girls into service along the railroad. Harvey had no shortage of applicants–thousands of women applied and were accepted every year from 1883 until the 1950’s.